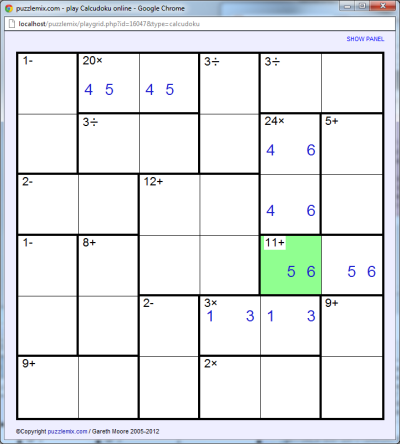 Calcudoku combines the row and column constraints of Sudoku with numerical regions that are similar - but not identical - to those in Killer Sudoku. 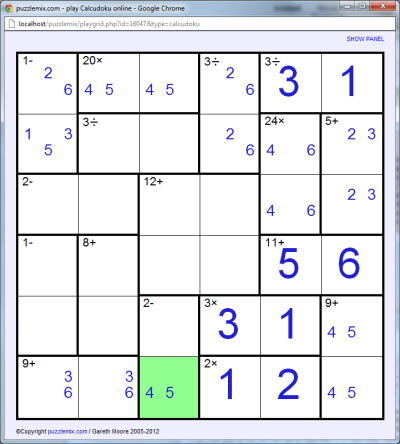 To solve Calcudoku, place the numbers 1 to 6 (or whatever the width of the puzzle is) once each into every row and every column. Further, the given value at the top-left of each bold-lined region must be obtained when all of the numbers in that region have the given operation (+, -, ×, ÷) applied between them. For - and ÷ operations start with the largest number in the region and then subtract or divide by the other numbers. In Mystery Calcudoku a '?' is given instead of an operation. In these you must work out the operation too - at least one of adding, subtracting, multiply or dividing results in the given total. 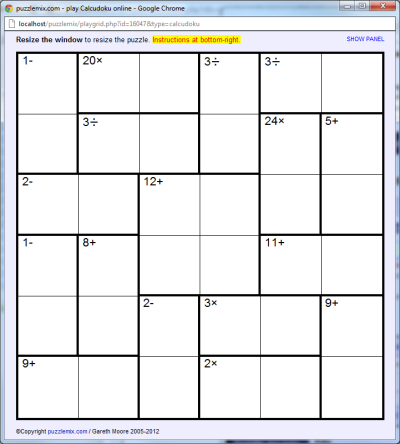 Note that there is no constraint on repeating numbers in bold-lined regions - calcudoku is different to jigsaw sudoku and killer sudoku puzzle in this respect. To help understand the fundamental rules, consider the "1-" region at the top-left of the puzzle below. The two numbers in this region must result in 1 when the "-" operation is applied between them, with the smaller number subtracted from the larger. Therefore possible solutions to this region are 1 and 2 (since 2-1=1), or alternatively 2 and 3, or 3 and 4, or 4 and 5, or finally 5 and 6, and these could be written in either order into the two cells. Notice how the green cell has three possible options to the two above it. This is because the possible solutions involving the 2 and 6 we have already placed are 6-5=1, 2-1=1 and 3-2=1 - i.e. the 1, 3 and 5 that are now options in that cell. 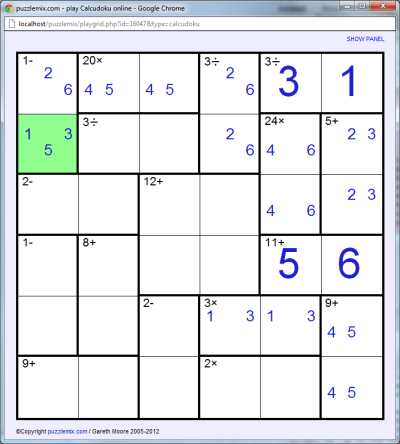 Calcudoku makes use of many of the same tricks that you will use on Sudoku and Killer Sudoku, but don't forget that numbers can repeat in bold-lined regions. This means, for example, that a 6+ region of 3 cells could be solved by 1, 1 and 4 (so long as the region was L-shaped, otherwise the row or column constraint would prevent the repeat).